The art of diving is to achieve perfect weightlessness. This means having control of your buoyancy – to be neither floating up nor sinking down and to be able to go in any direction at will, with the least effort. This is what scuba diving is all about. It is called neutral buoyancy. To achieve this, you need to get your weights right. They should be correct for your equipment and the suit you are wearing, as well as the water you are diving in. The ideal weight that you should aim for in a particular body of water is enough to allow you to float vertically with your eyes just above the surface. This should happen when you are wearing a full tank and your lungs are full of air. When you are floating in this way, you should begin to sink if you exhale. Inhaling from your regulator should make you rise back to where you were. You should never drop like a stone. This simple test takes into account the weight of air you will consume during the dive. At the end of a dive, with your tank empty, you will find that breathing in a lungful of air will raise your chin and shoulders well clear of the water’s surface. By having the minimum amount of lead weight as ballast, you will need the minimum quantity of air in your BC or suit. Some divers believe that wearing plenty of weight isn’t a problem because you can always add more air to your BC or suit to compensate for it. While this may be true, it makes achieving true neutral buoyancy much more difficult. As you go deeper and rise up again, the air in your BC or suit is subject to ever- changing compression and expansion. Therefore, the amount of water the air displaces is forever changing. 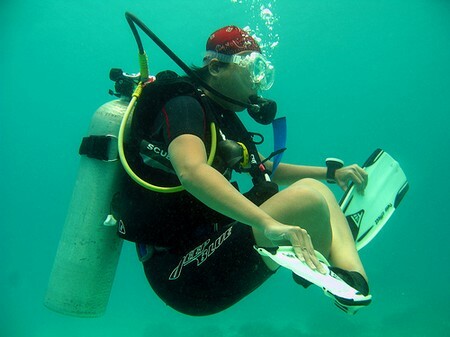 If you put a lot of air in your drysuit, it will move around, causing you to move with it. You will find that you have to make constant corrections by injecting and dumping air. Many inexperienced divers can be seen swimming in a semi-upright position through the water. This is because they have either too much lead or not enough air in their BCs. They are swimming upright because a lot of their effort in finning is used to maintain their depth rather than to progress in a horizontal direction. If your buoyancy is almost correct and you try to swim in a semi-upright position, you will head in the direction you are pointing to, which is up. As you rise, the air in your BC will expand. When this happens, you risk embarking on an unplanned buoyant ascent to the surface. The rule for good buoyancy control is use the minimum amount of lead combined with the minimum of buoyancy-compensating air. Neutral buoyancy means that all the effort you put into finning will go towards moving you in a horizontal direction. If you can achieve this, your air consumption will be dramatically reduced. Once your buoyancy control has been perfected, it allows you to enjoy your dive and experience the underwater world around you. It also frees you to pursue your interests. For example, you can take closeup photographs of a reef without the risk of accidentally crashing into it – and potentially damaging its delicate structure – because you are not in control of your buoyancy.